Topaz comes in many colors such as blue, yellow, pink, brown, green and colorless. Most of these varieties are not very expensive, even in good quality. 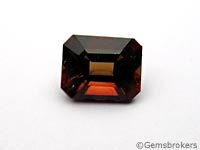 Dark yellow with reddish tint "Imperial" topaz is rare, and demands much higher prices. Pink stones, naturally rare, were in fashion during the 19th century even if their color was the product of heat treatment of brownish yellow crystals. When selecting topaz, as with all transparent gemstones and in order to get full brilliancy, attention should be given to the overall proportions. Topaz is one of the hardest gemstones, 8 on the Mohs scale, but has very easy cleavage and can be split with a sharp blow. Also, avoid large temperature changes and never clean topaz in an ultrasonic cleaner.